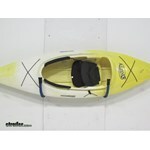 Keep your kayaks and canoes up and out of the way in your garage or basement. These storage hangers are strong and nylon coated to keep your canoe or kayak safe and scratch-free. 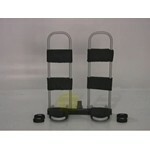 This hitch mounted golf club carrier has a space for 2 sets of clubs to be held upright and secure. It can be used on a car or an RV and includes an anti-rattle device. Boone Outdoor's tailgating accessories are essential for any serious sports fan. There are a variety of hitch-mounted accessories to make sure you have everything you need, from a table to a flag pole to wave your favorite team colors. 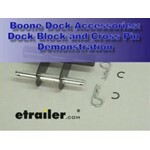 Boone Outdoor also offers a convenient way to store your hitch bike racks and other hitch accessories. They are easy to use and very durable, guaranteed to keep everything organized and out of the way. Boone Outdoor Hardware specializes in producing equipment that allows you to gear up for an outdoor adventure in just minutes. They also manufacture innovative and practical storage solutions for all your outdoor equipment. Basements and garages will stay organized with these useful products. Boone states that as long as the bottom plate of the Boone Docking Station Bike Rack Storage # BH92422 touches the ground it can be installed a varying angles within reason. There isn't an exact distance required for the foot to be mounted away from the wall so you'll need to use your bed judgment. A fiberglass flagpole like the Boone Sports Fan Telescoping Pole # 94999 is a good choice for avoiding the corrosion issues that can arise with metal poles when they are exposed to salt. This flag pole is designed for 3 x 5-foot flags and extends from 49-1/2-inches when collapsed up to 16-feet when extended. 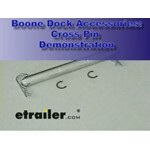 Boone offers a mounting base, part # 79553, and they also offer the pole and base together as item # 94999-53. Yes, the Boone Outdoor Hardware Tailgate Table # BH70114 that you referenced does come with a table cover. I went out to the warehouse and pulled Sports Fan Telescoping, Fiberglass, Multiple Flag Pole # 94999. When you extend the pole it locks into place with friction. The bottom part of each section is wider than the rest of the section so it cannot pull out of the section below it. To retract the sections it does take a fair amount of force so it would not collapse under the weight of a flag (unless the flag was very large). The Sports Fan Telescoping Fiberglass Flag Pole part # 94999 in itself is not rated for a particular wind speed. However, when used with the GameDay Tailgating Drive-Up Flag Pole Base part # 79553 the pair is rated for use in winds up to 60 mph. Therefore, as long as the beach winds do not exceed this rating then yes it will be safe for use. You can also purchase the flagpole and base together using the Sports Fan Telescoping Fiberglass Flag Pole with Drive-Up Base part # 94999-53. One solution for you is the No-Rattle Trailer Hitch Wedge # 93347. This wedge slides into your hitch receiver and then connects to your hitch pin. You will need to have a standard hitch pin for it to work properly. I've included a review video of the wedge you can take a look at. 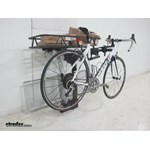 Also, if you tell me what bike rack you have I may have other more specific solutions for your setup that could help. The Brophy Stabilizer Clamp and U-Bolt # RSCP is not to be used for towing. If you're looking for something to use to tow the Boone No-Rattle Trailer Hitch Wedge # 93347 is a better option. According to the installation instructions the maximum weight capacity of the Boone Dock Bike Rack Storage Stand # BH92422 is 300-lbs. 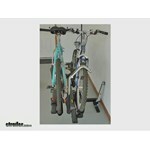 This stand will work with 2-inch shank bike carriers or other accessories. Exceptions to this fit are Thule and Yakima bike racks with built-in anti-rattle devices. If you have a Thule or Yakima rack, an adapter pin # BH83747 would be needed. If you click the provided link, you can see a product demonstration video. The snaps will slide on the pole some so the size can vary. 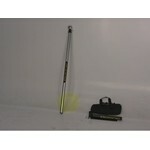 It is primarily designed for 2 each of 2 foot x 3 foot or 18 inch x 24 inch flags. But you could put 1 each of a 3 foot x 5 foot on it as long as you were not in 60 mph or more winds. The base, or flat, is 3-3/4 inches x 15-1/2 inches and works great. The manufacturer warranty is 3 years for the base and 1 year for the pole. For the pole you need to be sure not to set heavy items on it like coolers full of your favorite beverages. The anti-tilt bracket # 93347 would be a great fit based on the pictures you have included of your 2012 Chrysler Town and Country. Or you could use # SHP2082 if it does not require a locking hitch pin. To stop the hitch pin from moving in the hitch of your truck you would use the No Rattle Wedge part # 93347 as it will secure the hitch pin and prevent movement. I attached a review video for this product for you to check out as well. We offer many types of hitch stabilizers, immobilizers and anti-rattle devices. Examples include the cost-effective Boone No-Rattle Trailer Hitch Wedge # 93347 which works on 1-1/4-inch and 2-inch hitches and the Blue Ox Immobilizer # BX88224 which works on 2-inch hitches and that stabilizes your ball mount in both vertical and horizontal planes. This is my recommended choice. 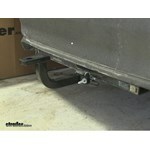 All 2-inch anti-rattle products for towing are shown on the linked page. The Boone Outdoor Hardware Tailgate Table, part # BH70777 does fold up for easy storage. The table top measures 20-inches x 48-inches, and it is designed to work with 2-inch trailer hitch receivers. The dimensions of the plate in the GameDay Tailgating Drive-Up Flag Pole Base # 79081 is 15 inches long by 3-1/2 inches wide. I have attached a diagram of these measurements. This base is designed to fit with the Sports Fan Telescoping Fiberglass Multiple Flag Pole # 94999. 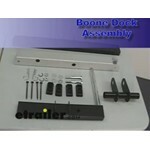 I went out to the warehouse and pulled one of the Boone Outdoor Hardware hitch stabilizers off of the shelf. 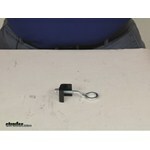 The paper card included with the stabilizer did not provide any instructions, just a photo of the installed stabilizer. If you look at the photo I have edited for you, you should get a good idea of how the wedge fits. 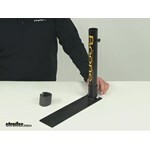 I have also filmed a short video for you showing how the Boone Stabilizer is used. To reduce the movement in the trailer hitch with your Yakima BigHorn 4-Bike Hitch Mount Rack, I recommend looking at the No-Rattle Trailer Hitch Wedge # 93347. This is a great and simple device that will wedge itself between the 1-1/4 inch receiver on your vehicle and the bike rack shank to eliminate the rattle you are experiencing. I have attached a video demonstration of this product so you can see exactly how it works. A neat feature on the 2014 Honda Ridgeline is that the tailgate can swing open like you describe AND it can be lowered like a regular tailgate. Table # BH70777 would interfere with the swinging operation of the tailgate but with the tailgate tilted down the tailgate could be lowered. It is not uncommon for there to be some movement in the system when a trailer is not loaded. If this movement is causing rattle you try adding our No-Rattle Trailer Hitch Wedge, # 93347. This device will wedge itself between the receiver and your weight distribution shank to help take out the slop/play that you are experiencing. Rest assured that once you get your trailer hooked up to your 2012 Ford F-150, the weight of the trailer will correct this and there won't be an issue. As long as the Vertical Drawbar part # D-55007 is being used in the correct Curt Hitch part # C11748 you can use the anti-rattle device part # 93347. I attached a review video for this product for you to check out as well that shows how it works. Although the 15 inch deep hooks of the # B9099 kayak hanger would probably work for your canoe, Boone offers a hanger set specifically designed for canoes, part # BCK169. I'd recommend using the canoe hanger, because of its high 130 lb weight capacity and its deeper 18 inch hooks. The inner diameter of the flag pole tube of the # 79081 is about 1.64 inches. You will need to allow some room for the set screw to get ahold of the flag pole. Boone does offer a flagpole, part # 94999, that will fit with this base. It doubles as an anti-theft device in that it would require the thief to have the correct size wrench to first remove the Anti-Rattle Device part # 93347 before your ball mount could be taken. While it doesn't have a lock it would make stealing the ball mount more difficult. Check out the review video I attached as well.